Chips and salsa is a given pretty much every day of the week around this house, not just because my husband and kids are Hispanic, but because chips and salsa is just plain delicious! There is no getting around that, not that I’d want to, ha! 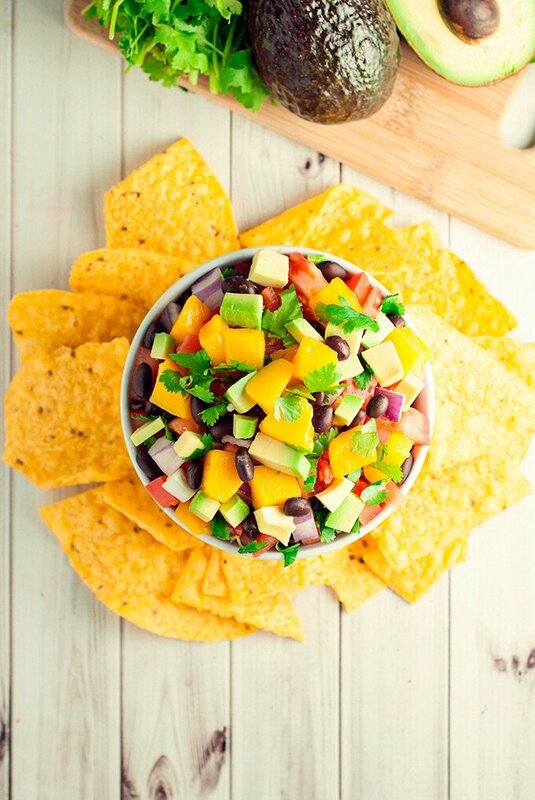 There are so many ways to make salsa, and so many ingredient options, the flavor is always a little different each time, and this two-minute mango salsa is no different! Flavor! Spice! Much yum! 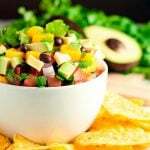 When it comes to mango salsa, I like it super chunky, almost like a pico de gallo, so to make this two-minute version, I needed to get a little creative to get the texture I wanted. And I totally succeeded, because this stuff is awesome. 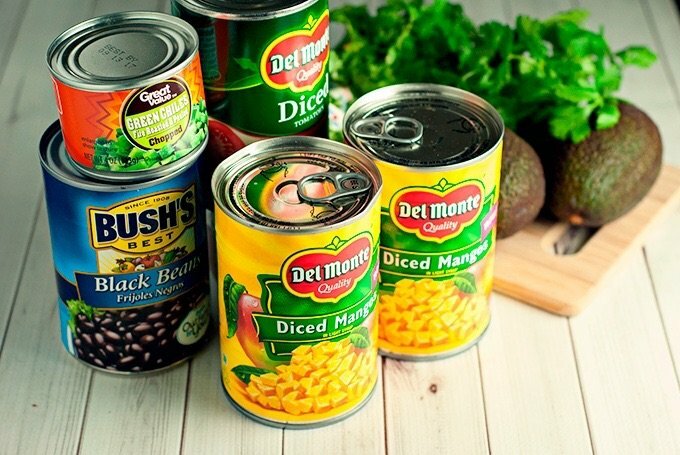 In addition to the beautiful Del Monte Diced Mangos, I grabbed a can of their diced tomatoes, as well as black beans, and green chiles. And since I was shopping at Walmart, I hit up the produce department to grab a package of diced red onion (how awesome is that, seriously? No tears! ), as well as an avocado and cilantro. There was literally almost no work involved. Just dicing the avocado and tearing some cilantro. Otherwise I just tossed it all in a bowl, threw down some chips, and watched everyone go crazy trying to get the first bite. Vivi won, by the way. She’s a badass salsa-lover. This easy two-minute salsa is already on the menu for our Super Bowl party, and I can’t wait to watch a great game! But since I have four kids who will likely grow bored at some point, I’m keeping a DVD of The Book Of Life handy to entertain the kids once they’ve decided they’ve had enough of football! I’m planning smarter, not harder, this year. 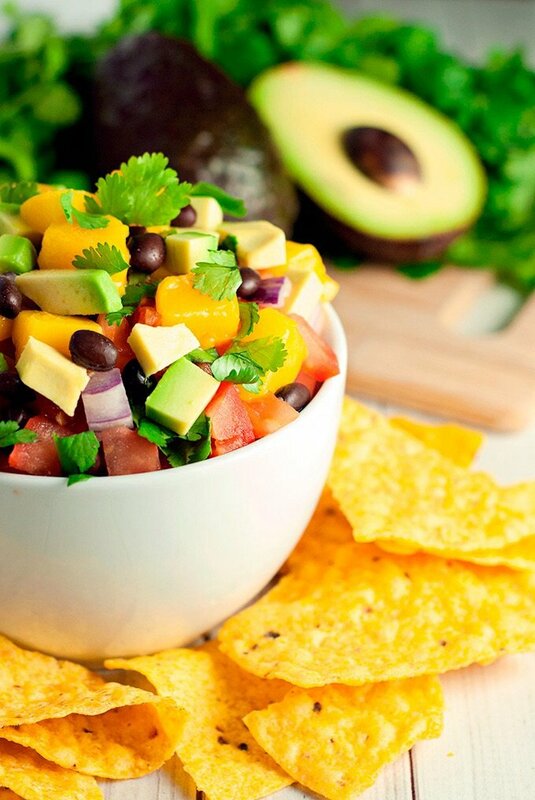 Combine all the ingredients in a bowl, sprinkle with salt and pepper, and serve with tortilla chips. Make sure you head out to select Walmarts between 1/22-1/25 for their in-store demos with Del Monte Diced Mangos and pick up your copy of The Book Of Life, available 1/27! WOW! 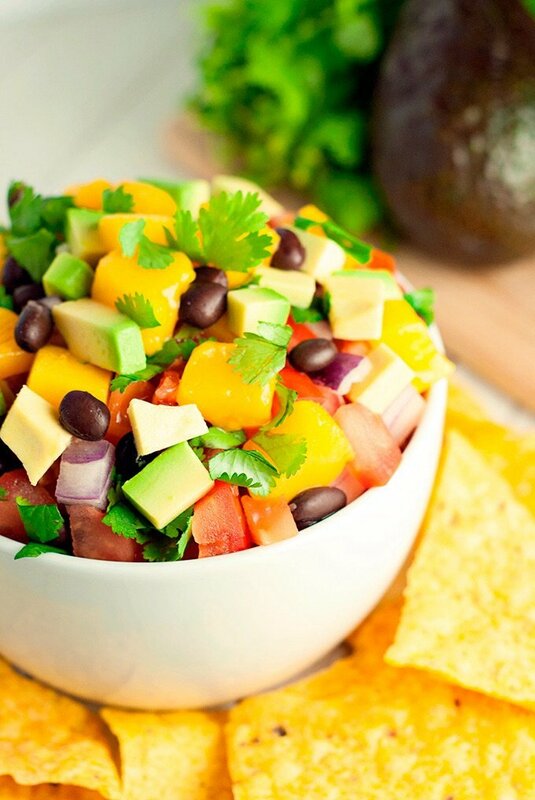 This mango salsa looks absolutely amazing! I would never think to add black beans-- genius! Ha ha ha, my Vivi is a salsa-hoarder too! omg i am starving now!!! How delicious! 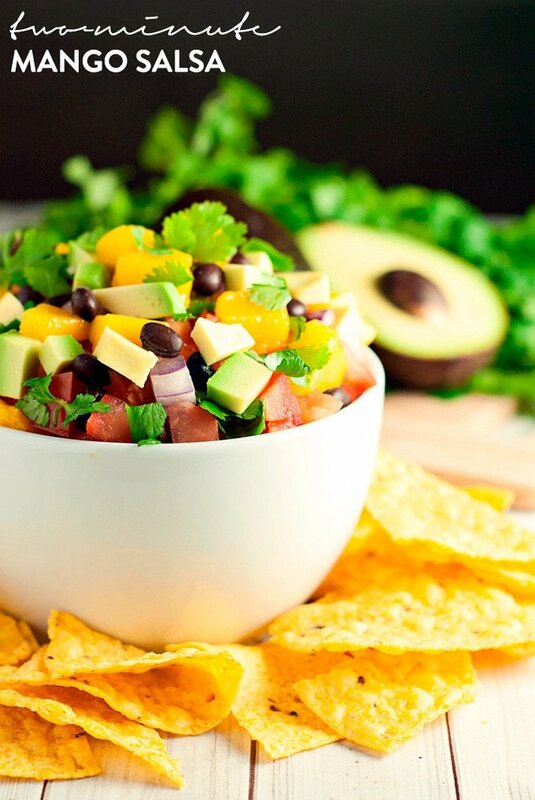 This salsa looks amazing, I love the chunky texture too, and love mango salsa! I'm pretty sure I could eat that whole bowl in one sitting!!! So you've just rocked my world! THEY MAKE CANNED MANGOS! I've always steered away from making anything with mangos because they are like THE WORST fruit to cut. Ya, ya, they have froze, but you've got to thaw and blah blah blah. This looks awesome1 So trying it out! Thank you for sharing on Found & Foraged! I made a Mango Salsa during the summer and it entailed lots of cutting and peeling. I like your version much better! Thanks so much for linking to the This Is How We Roll Thursday link party! I can't wait to see what you share next week! I will be trying this for sure! Thank you for sharing on Show Me Saturday! I absolutely Love Your Blog!! It is fabulous how you have done such a spectacular job in customizing and making it your own. Your writing is also brilliantly composed. Kudo's on such outstanding job and success of your blog. You are a talented writer and awesome photographer. I salivate over how scrumptious looking your recipes sound and the images are just icing on the cake... Bravo on a job well done.. You are such an inspiration..
Oh my, Juliet, you just made my whole week! Thank you so much for the kind words, I really really appreciate it!